Tree mulching and wood-chipping services not only help getting rid of cut branches or trees from your property but also transforming them into wood chips that can be used for different beneficial purposes. They can be used as mulch around plants, helping them retain more water and also protecting them during days or seasons with high and especially low temperatures when they risk freezing. Wood chips can also be used as composting material, having a high concentration of carbon and this helping improving the quality of the soil. Furthermore, they can be used for walkways, as a layer of wood chips will prevent the development of weeds, or for improving the look of your garden, spreading them in different patterns around and/or between plants in your garden. Another way you can use wood chips is for temporary erosion control, as they will hinder the loss of soil. Plus, as well known, wood chips are really useful in making fuel. In consequence, many benefits may arise from using a wood-chipping service. Either you have a large source of timber that needs to be processed into chips, or need to trim or remove a tree which will then need mulching services, we can come to your rescue. Our arborists dispose of vast experience in mulching and wood-chipping services, using the best quality equipments. 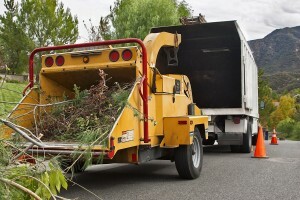 Tree King Tree Services’ wood chipper has the power of converting messy debris into a valuable resource. This means disposing of brush piles is now easy, which can also be used for creating ground cover that’s ideal for pathways and flowerbeds or improving the composting process. We use the latest equipments on the market to undergo our work and provide high quality services for you. Our team can also help you clean up unwanted branches that take up space and can also be posing fire hazards. Call us now on 04 04 04 33 33 for our mulching and wood-chipping services.